With the trouble times that have been plaguing the galaxy, Taeli thought it might be a good idea to build a new lightsaber for her personal use, while also keeping her old one. To that end, she used some phrik that she had obtained on a visit to the Roche Asteroids and crafted a brand new double bladed spinning lightsaber out of the material. The hilt contains the inner workings of the lightsaber, with a half circle of metal acting as a hand guard in the style of a rapier. Two blade emitters reside on either end of the hilt and are connect to the hand guard by locks. 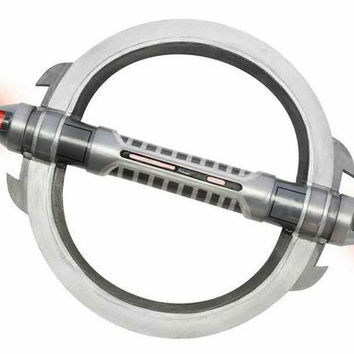 The hand guard itself contains a second half that can slide out and form a full circle around the hilt, allowing the blade emitters to unlock and spin around the ring on a gyroscopic track that can channel the energy produced by the power matrix of the lightsaber. The design is to both be an elegant rapier style lightsaber, while also being a horrifying and devastating surprise when the second blade and the ring activate. The three phase design allows usage in many different fighting styles, allowing the user to switch between modes and use either fast swipes or elegant parries and thrusts. The spinning mode also acts as a superb defense against blasters and other lightsabers. The lightsaber has the standard weaknesses of double-bladed lightsabers when in that mode, as knowing where one blade immediately tells an opponent when the other is, even when spinning. The spinning mode also can drain a lightsaber's battery faster due to the gyroscopic ring requiring power to rotate the emitters, meaning that mode cannot be active for longer or risk losing power to your lightsaber in the middle of a fight.